There’s nothing like a birdy, bird-filled lunch and I’m not talking about some lemon domesticated jungle fowl tagine either (although that is damn good too!). I mean watching cool birds at close range while enjoying the midday repast. In Costa Rica, whether I happen to be birding for fun or searching out target birds for others, I strive to combine birds with lunch. In Costa Rica, that’s easy enough to do. 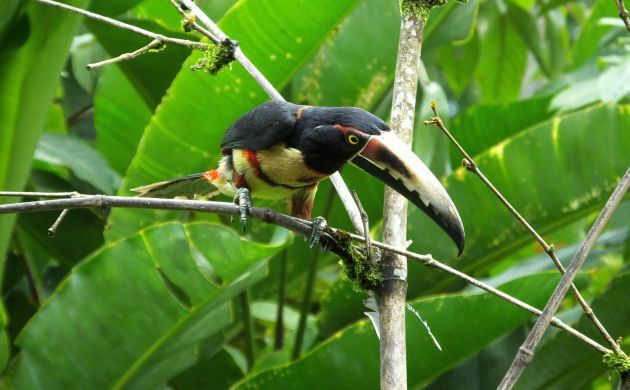 All you need are a few bananas, plantains, and papayas, and the birds come a flying. 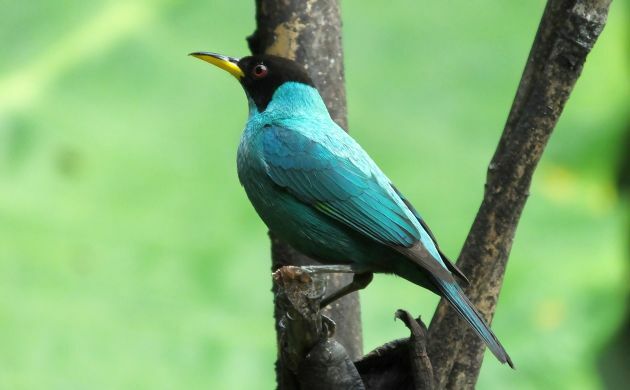 Most are commoners like the good old appropriately named Clay-colored Thrush, Blue-gray Tanager, Palm Tanager, Great Kiskadee, and saltators but you can also be surprised by tropical woodpeckers, toucans, and chachalacas. It’s all good because no matter which birds show, they can do so at crazy close range. 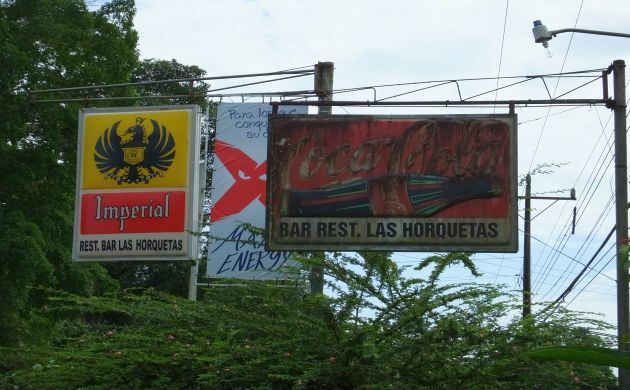 Recently, while guiding in the Caribbean lowlands of Costa Rica, I have had the pleasure of enjoying lunch with birds at an overlooked gem known as the Bar Restaurant Horquetas. Don’t be put off by the moldy sign, that’s par for the course when you pour 12 feet of a rain on it per year. In Costa Rica, there are lots of little, family-owned diners like this one. If you see “bar” and “restaurant” on the same sign, it’s because they have a liquor license. Most offer good, home-cooked fare but very few also happen to feed the birds. As for the Bar Rest. Horquetas, you wouldn’t even know that the owners were bird friendly if you didn’t enter and take a seat. Go in and sit down, and shortly thereafter, someone will come by with menus in one hand and plantains in the other. 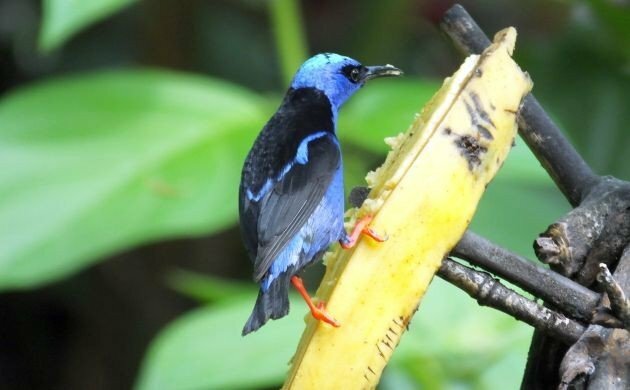 As soon as they put those plantains on sticks in their tiny garden, birds come out of nowhere to munch on the fruit ten feet from your face and the camera lens. 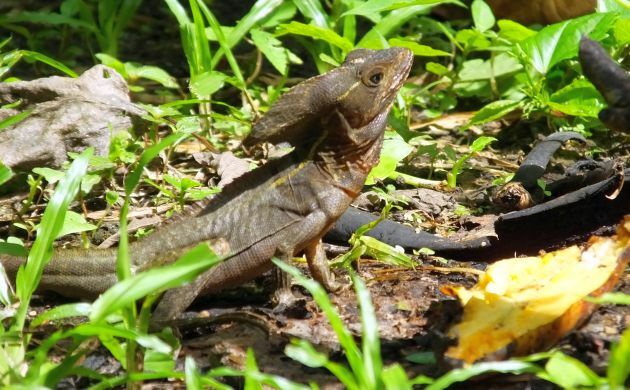 On the ground, Striped Basilisks also show up for scraps. 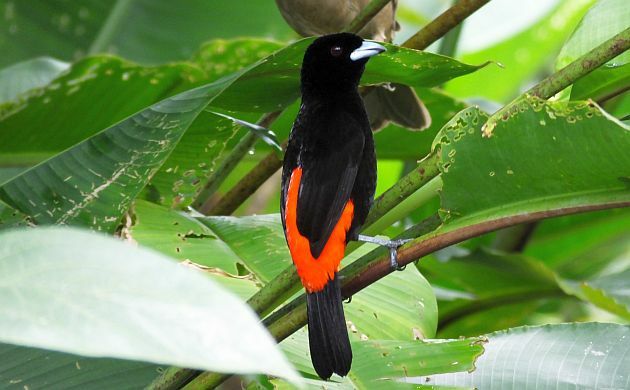 If you happen to be birding in Costa Rica at or near La Selva, and feel like enjoying a local lunch accompanied by a bunch of colorful birds, make a stop at the Bar Restaurant Horquetas. If coming from the La Selva area, go 13 to 14 kilometers south on the main road to Guapiles and watch for the small restaurant at a wide turn-off on the right. If coming from the road through Braulio Carrillo National Park or Limon, watch for it on the left, about 15 kilometers after the turn off onto the roadto Puerto Viejo de Sarapiqui. Wonderful article Patrick! 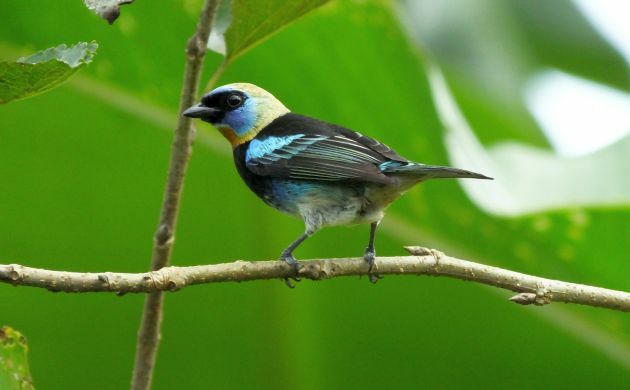 Traveling to Costa Rica last March with a small birding group for the first time and seeing 340 species and it’s breathing land has filled my heart like nothing else! We had many lunches like you spoke about, eating and bird watching at the same time, something you would not get New England, USA. I look forward to reading your Blog posts while saving for my next trip back next year to the Highlands. Some of my special photos have been posted on my website. Thank you! 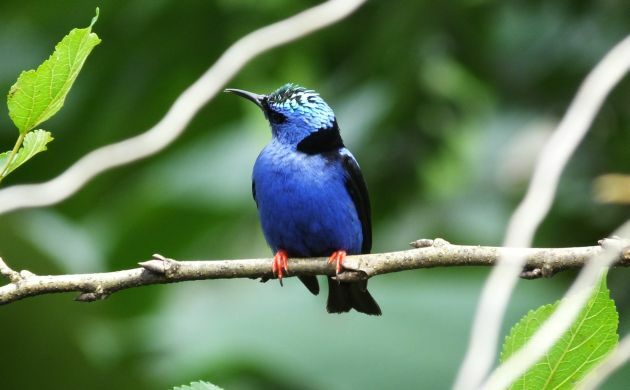 Do they have hummingbird feeders (HF) in Costa Rica? The idea of setting up HF in Ecuador seems popular in Ecuador and quickly catching up in Peru. I don’t seem to remember seeing hummingbird at feeders from Costa Rica, but I am sure I am wrong….